An important aspect of being a Jedi is loving oneself and following a lifestyle that encourages a deep and meaningful connection to the Force—the energy that permeates and sustains life. In modern times where we are surrounded by frivolity, convenience and artiﬁciality, it is increasingly more diﬃcult to make positive lifestyle choices that beneﬁt our body, minds and spirits. Is it not easier and cheaper to consume fast-food or a prepackaged meals ﬁlled with preservatives and empty carbohydrates than prepare a wholesome one made with fresh ingredients that are imbued with the very essence of the Force? Is it not more instantly gratifying to watch something on a streaming service or scroll through social media on one’s smart phone than to get up, change and workout at the gym, go for a run or much less- a walk? Is it not more enjoyable to go out and party most Friday nights, consuming more alcohol than we should, only to wake up with a hangover instead of obtaining beneﬁcial rest that allows us to maximize our potential and enjoyment the next day? Of course it is, and we have all been guilty, me especially, of avoiding what is beneﬁcial with a myriad of pre-made excuses that deep down we are ashamed of but hide behind nonetheless. This guilt and shame springs from the knowledge that we know better; that we are neglecting our well-being which results in lessening our attunement with, or even cutting ourselves oﬀ from, the Force. Before I go further, I acknowledge that most things are good in moderation, that breaks are important, and perfection cannot be obtained. Life must be enjoyed and temporary deviations from the healthy path should be and are encouraged to be taken. However, this requires discipline, which I will address in a later installment, so that one does not become lost again in laziness and hedonism. I also want to note that I am neither a physical trainer nor a dietician and that before attempting any drastic change to one’s physical regime or diet, it is best to consult a medical professional ﬁrst. I am also not perfect and I am still in the process of bettering myself. I, like all Jedi, are continually learning and seeking improvement. These things aside, I, who have struggled several years in this ﬁght, want to help you as a fellow Jedi and pass onto you my knowledge in hopes that you awaken that desire within you to love and care for yourself in the Force as I have learned to. 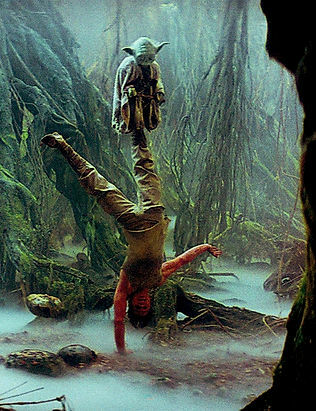 If we look at our ﬁctional counterparts in Star Wars movies and ancillary material, the Jedi are all physically ﬁt beings. We should acknowledge the reality that these are paid actors and are hired for their superﬁcial qualities and that they also prepare physically months in advance for their roles. Heroes and heroines in movies are purposefully attractive so as to draw our attention to them and make us wish to become them. Why else would we be here if we did not identify with and desire to be like Luke, Anakin, Obi-Wan, Rey or another Force-wielding character? It is only right that we want to emulate our heroes, but these movies show our beloved characters living in extreme circumstances in short amounts of time and do not illuminate their day-to-day habits that allow them to ﬁght, survive and win the day within these ﬁctional tales. No, we may not be able to “use” the Force in the way and manner that Luke Skywalker does when he calls his lightsaber into his grasp in order to free himself from the Wampa’s lair or defeat an enemy with a sword of light in a snowy wood but, we are capable of great feats through the Force if we only improve our connection to it by doing what is right for our bodies and minds. It is achieved with eating well, exercising and resting but begins with changing one’s attitude and behaviors to align with the will and nature of the Force and abandoning those actions, thoughts and beliefs that are detrimental to our health. I will attempt to instruct fellow Jedi on how to start their journey on this path to physical well-being in at least four installments that will follow this introduction. I will not focus on the minute, nuts-and-bolts of nutrition and exercise, but will discuss the larger, macro perspective that allows one to arrive at the desired end-state: a healthier life that will transcend to a deeper connection to the Force. Detailed topics regarding physical ﬁtness techniques and speciﬁcs on nutrition can and will be discussed in further installments after this series, found on the Ways of the Force Forum, or questions can be directly messaged to me via e-mail or other electronic means. Going forward, I will discuss the path to physical well-being and a more meaningful connection to the Force in a linear, chronological matter that mirrors a “step” approach. Part One will discuss “Acknowledgement & Desire”. This cornerstone step is coming to the realization that there is room for improvement in one’s physical lifestyle and then translating that understanding to desire. Part Two focuses on “Acquiring & Cultivating Discipline”. This step is where the true hard work lies, and where one can really demonstrate Jedi behavior by taking that desire found in the the ﬁrst step and turning it into a vehicle for positive change by mastering and overcoming one’s selﬁsh desires and complacency through personal determination and the Force. Part Three is concerned with “Action & Fruition”. Once discipline is achieved, one can start to aﬀect positive change through action and eventually, labors will begin to bear fruit. Part Four, “Realization & Continuance,” is the culminating step where a Jedi will begin to feel conﬁdence in his or hers abilities, the beginning of a deeper connection to the Force and and overall improved physical well-being. However, a Jedi must never rest on their laurels but, continue to improve his or herself and gain further understanding lest they regress in their quality of life and attunement with the Force. I hope you take this journey to love and care for yourself as you should—to become a better, healthier Jedi and a true inspiration for those around you. We must also be ready to help those in need and bring peace and understanding, no matter the physical, mental or spiritual stress that may face us. By being healthier we improve our resiliency and resistance to such stress, allowing us to succeed where other beings falter. I also wish for you a quality of life that allows you to live longer and fuller so that you may learn and serve the Force for as long as our bodies comprised of “crude matter” allow us. I am here to help you. However, you, Jedi, are the one that has to face and pass this trial within yourself because that is all that stands in your way. May the Force be with you.